So, I finally got one that didn't come with 1os (4th roll with mechanics). It isn't perf but.. meh I'll keep on trying. All that is good has its roots in evil. All that is evil has its roots in good. This is the one weaj and I crafted for our min damage charger. I think it h as some base cold res too. One of my Fissure druids shields and probably the only crafted item I use on any character. paul gave me a nice one i can't remember stats though, i'll find it! anyone have some nice lld OW belts to post? 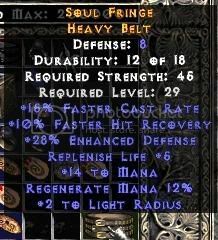 I've got a decent level 29 open wounds belt, not that I'm sure if anyone would use it. I'll try to post it later on. 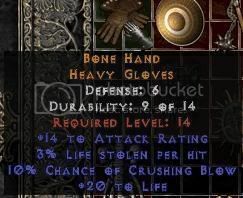 Actually I've got a handful of random nice crafts, when I'm bored I'll try to upload them. 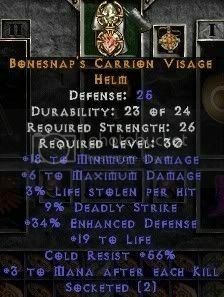 Life Rep Boots, FCR belts, OW belts, DS helms.